We hold regular exchange visits with our twin town in Germany in an alternating pattern of group visits to Germany and of receiving our German counterparts in Harpenden. Visits normally take place during the summer months and last from Thursday to Monday. Each visit will consist of a programme of events put together by the local town twinning group for their guests. If you are interested in taking part in one of these exchange visits to Germany or would consider hosting someone from Alzey please contact us. Our next visit is timed to coincide with Alzey’s wine festival (Winzerfest), which opens on Friday, 20th September. See this link (in German). The Friends of Alzey visited this festival many years ago, so our 40th anniversary year feels like an appropriate time to experience the highlight event of Alzey’s busy calendar again. If you would like to join us please contact us. The organisers in Alzey will need plenty of notice of hosting requirements as this festival draws many visitors to their town. 18 Friends of Harpenden journeyed here from Alzey recently for an especially sun-drenched high summer weekend of friendship and discovery. They were welcomed by the Deputy Town Mayor at a small reception at Harpenden Town Hall on Thursday June 28th. The following day they went by coach with their hosts for a conducted tour of Highgate Cemetery then visiting Hampstead Heath and Kenwood House. London's modern skyline, clearly on view from the Heath, made both an excellent backdrop to the 2018 group photo and a striking contrast to the Victorian architecture on view at the Cemetery. On the Saturday many hosts took their guests into central London, whilst others, with the mercury rising to nearly 30 degrees, opted to stay closer to home. The continued hot weather deterred few participants from enjoying a Sunday morning walking tour of historic Harpenden courtesy of our President, Rosemary Ross, of the Local History Society. That evening all guests, hosts and several other Friends of Alzey gathered at Marford Hall, Wheathampstead, for the 'best of British' - Pimms, fish and chips, homemade trifle followed by two games of Bingo! Chairs Gabriele Müller Gebhardt and Susan Vinther reaffirmed their organizations' commitment to this long friendship between Alzey and Harpenden. The visitors departed on Monday July 2nd delighted with their Harpenden weekend. Plans are already being made for the return visit to Alzey in 2019. 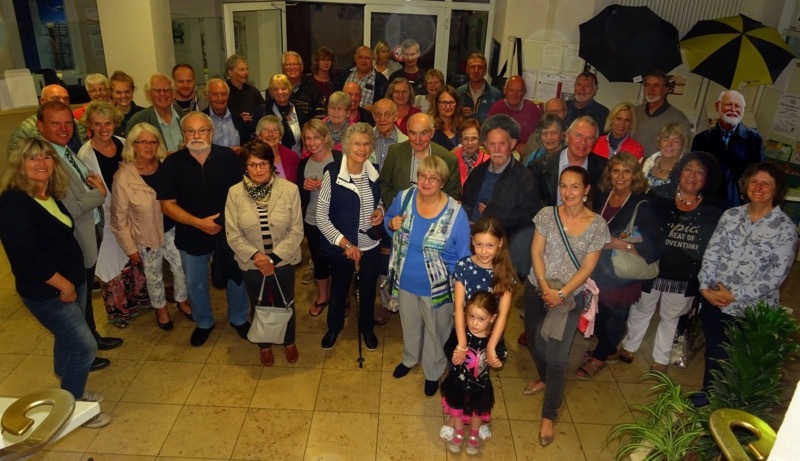 30 members of the Friends of Alzey once again received a very warm welcome in Germany for their long weekend visit in early August. They were met by Alzey's Mayor at a Reception with local wine and brezels, and were treated to a full day's group outing the next day. 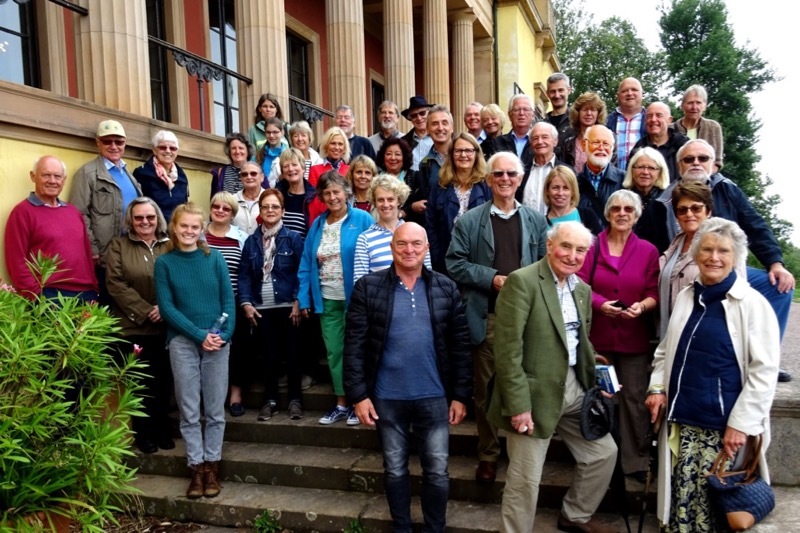 The Harpenden visitors enjoyed a tour of a former Royal summer residence, free time in the delightful town of Neustadt and a wine-tasting in a family owned winery in Kallstadt. They learned that Donald Trump's father spent his early years in Kallstadt, so for a small place it is receiving a large amount of attention. The weekend continued with time with host families, an optional visit to a local street festival and a farewell dinner. The new Chair of the Friends of Alzey , Susan Vinther, was accompanied by her teenage daughter, one of four teenagers to enjoy German hospitality during another successful visit. 20 JULY - Harpenden's Friends of Alzey played host to 32 of their German counterparts last weekend. 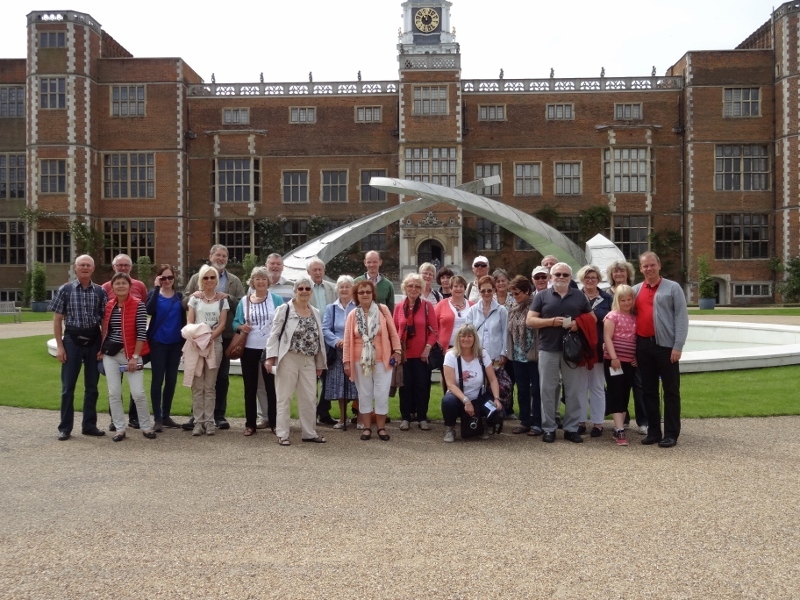 The German visitors came to Harpenden for a long weekend of activities that included a visit to Hatfield House, excursions with their host families and a walk on the Dunstable Downs. The visit began with a reception hosted by Town Mayor Nicola Linacre at Park Hall. The Mayor of Alzey, Christoph Burkhard, took part in the visit with his family. Alzey's wine queen, Marie-Charlott Stoehr also participated in the visit. The visit concluded with a hog roast dinner at Park Hall with musical entertainment provided by the Kings of Herts, Harpenden's barbershop chorus. 'This was another very successful visit', said John Lough, Chairman of the Friends of Alzey. 'Not surprisingly, there was a lot of discussion of Brexit and a strong view on both sides that people contacts are particularly important at this time of change in Europe.' Plans are already in progress for the visit to Alzey next year. 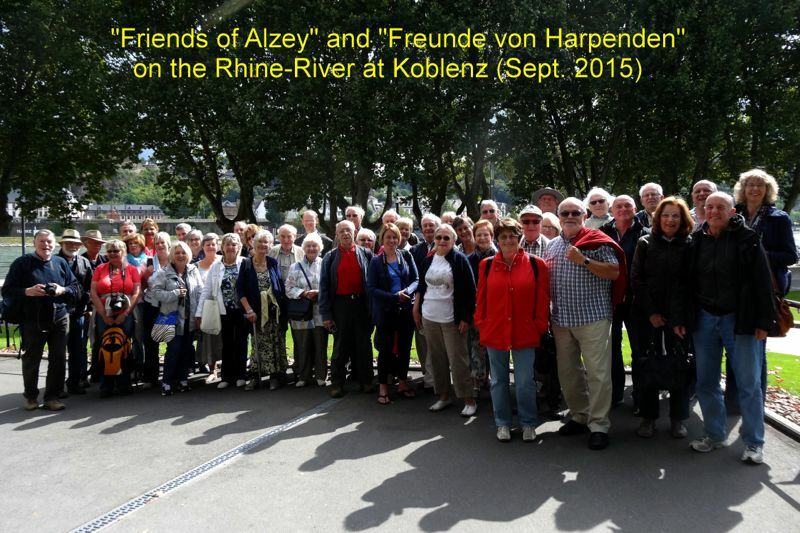 HARPENDEN - Harpenden's Friends of Alzey played host to 32 of their German counterparts at the end of August. 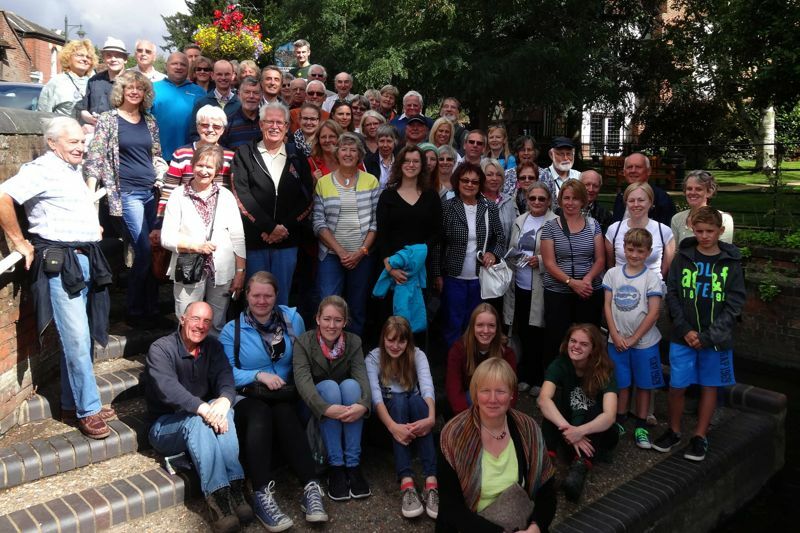 The German visitors came to Harpenden for a long weekend of activities that included a visit to the State Rooms	at Buckingham Palace, excursions with their host families and a walk along the Wheathampstead Heritage Trail. The visit began with a reception hosted by Town Mayor Mary Maynard at Park Hall. "We had a great time with our German guests", said John Lough, Chairman of the Friends of Alzey. "We were delighted to see old friends and make new ones. These personal contacts are the essence of twinning." Plans are already in progress for the visit to Alzey next year. VISIT FROM HARPENDEN'S GERMAN TWIN TOWN July 11 2011 - Harpenden hosted 29 visitors from Alzey, its German twin town at the weekend. The visit organised by the Friends of Aley included Mayor of Alzey Christoph Burkhard who was making his first visit to Harpenden. The three-day visit featured a tour of the Olympic site, participation in Sunday's Highland Gathering at the invitation of the Lions Club as well as time with hosts. Chairman of the Friends of Alzey, John Lough, said: 'The visit showed again the very strong personal links between Harpenden and Alzey. We were particularly pleased that the Mayor could be involved and see what we do.' The Friends of Alzey will make their next visit to Germany in 2013 to coincide with the 50th anniversary of the twinning between the two towns. In keeping with the successful bi-annual exchange visits the Friends of Alzey travelled to Alzey in Germany in August 2010. Please check out the article published by the newspaper Review summarising this trip to Germany. 34 guests from Alzey visited Harpenden from August 6th to the 10th 2009 in the 2009 exchange between the Friends of Alzey and the Friends of Harpenden. The Committee of the Friends of Alzey arranged the programme that included a visit to Cambridge and Ely, coffee and a tour of Luton Hoo and a Hog Roast at Redbourn Recreation Centre. In contrast to the previous visit from Alzey in 2007, our German guests enjoyed some fine English summer weather. John Lough, Chairman of the Friends of Alzey, called the visit a "terrific success". "It is great to see the continuing enthusiasm for these contacts in our two communities", he said.